The Minneapolis Federal Reserve Bank can be seen as a three-story, windowless vault, intended to evoke the strength and security of America's central bank. The portico and base course were constructed of granite quarried at Rockville, Minnesota, near St. Cloud. The cornerstone weighed twenty-two tons—the largest block of granite quarried in Minnesota up to that time. The remainder of the building was faced in Indiana limestone. The main door weighed nine tons. The frieze and entablature encircling the building were supported by engaged pilasters and a colonnade. The Corinthian composite capitals included volutes among the acanthus leaves. The upper two floors were recessed from the main block of the building and had windows that lit the office spaces. A large-scale parapet and balustrade surmounted the upper level. A vertical offset at each of the building's corners preserved the straight lines of the building and added emphasis to the proportions of each elevation. This design, intended to express power but to exclude the public from the wealth within, is quite the opposite from Gilbert's design for the Minnesota State Capitol, which is equally powerful but intended to be fully open to the public. The design of the building followed a pattern that was begun by James Knox Taylor, during his fifteen-year tenure as Supervising Architect of the U.S. Treasury, of designing federal buildings in the American Renaissance and neo-Classical styles. Although Taylor left his post in 1912, the styles he championed continued well into the Great Depression, culminating in Gilbert's U.S. Supreme Court Building, which was completed in 1935, a year after Gilbert's death. The Federal Reserve Bank system was established in 1913, and the Federal Bank of Minneapolis was chartered in 1914. 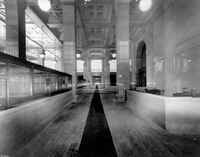 In January 1915, it opened for business in the New York Life Building at Second Avenue South and Fifth Street. 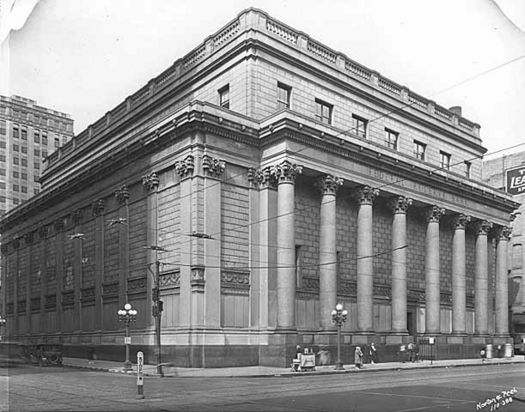 By 1921, the bank had outgrown its accommodations and purchased a site at Fifth Street and Marquette Avenue. [Mpls-Fed-web] By that time, Gilbert's connections within the Federal government were unparalleled, so it is hard to say just what influences produced this commission. Though twenty years had passed since he left Minnesota, he was still well respected there. It must not have been lost on him that he had done little work in Minneapolis, and the Federal Reserve Bank would be his major monument in that city. 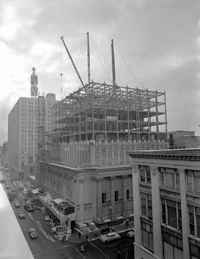 Gilbert's building was officially opened on January 1, 1925. As the Minneapolis Federal Reserve Bank continued to expand its operations, eight floors were added to the building after 1957, and the building was refaced. In the 1970s when the federal government decommissioned the building, developers added several more stories to the building, totally refaced it, and gutted the interior. The major interior space was a banking room of grand vertical and horizontal dimensions that was finished in Italian marbles and travertine. Located on the second floor, the banking room was accessed by a massive cast-bronze stairway. The light fixtures and bronze partitions were also designed by Gilbert. The reception rooms and executive offices were finished in American black walnut with teak floors. The grand bronze stairway, cast in New York, was sold for salvage and was reinstalled in the Grand Garage shops in Stillwater, Minnesota, where it can be seen today along with several other architectural details salvaged from the bank building, including a portion of the skylights.